Goma is an average size city (about 300 000 inhabitants at this time if I remember well), made of a rather pleasant centre (photo above) and of suburbs. 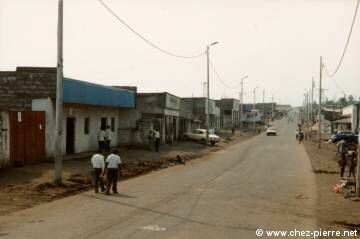 In the North, some factories, businesses and the airfield, along the road towards the Rwindi. If you continue a few hundreds kilometres, you can go to Uganda. In the East, nice districts and some hotels before arriving at the border with Rwanda, the unique "real" exit in case of problems, unfortunately closed shortly after my arrival. In the South, the Lake and the former residence of the president, occupied by servicemen. On the West one passes next to the enormous "township" where the majority of the Zairean population lives, then one turns southward passing by the lake. It then goes by the new presidential residence (amusing : the road is lit and asphalted from the airfield to the residence, not anywhere else ;)) then by beautiful districts of villas on the lakeshore, by the very beautiful Karibu hotel, finally one arrives at the Canadian Base : civil base for the Canadian volunteers, numerous in Goma (we used to play volleyball there, on Sundays). The road continues towards the Green Lake (see "Balads in Jeep"), the Masisi (magnificent region! 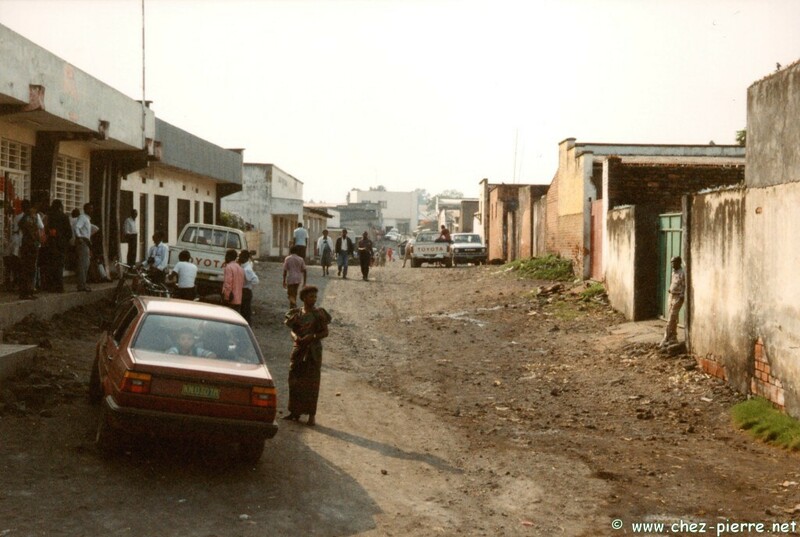 ), then Bukavu in the South of the lake and farther, Bujumbura in Burundi. We find "everything" : the post office (which worked so-so), banks, and businesses. Many of these were held by Pakistanis and many goods were for sale, but irregularly because of the war and the plunders during the riots. When there was some meat or some cheese, it was better to buy a good quantity of it... At the risk of losing everything with the next power outage ! 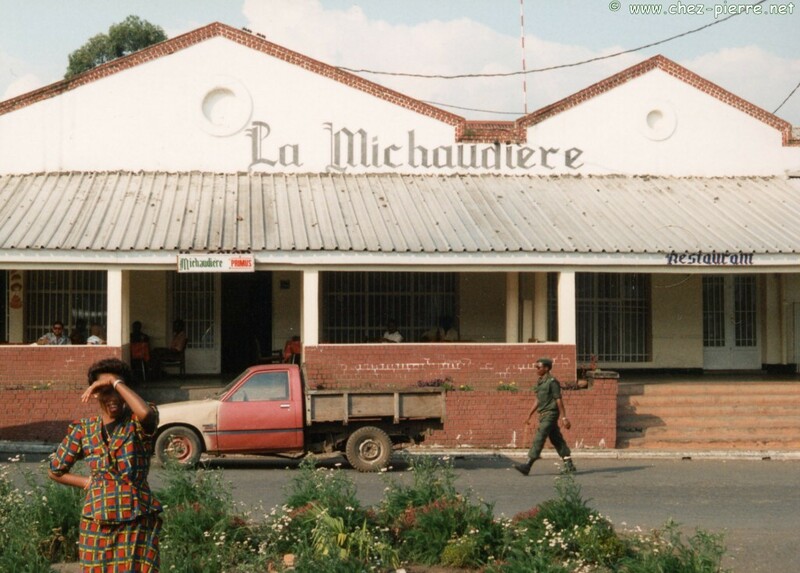 The other reason: the exchange rate, which was 12 Zaire / BEF when I arrived, and in one year rose to more than 900 Zaire / BEF; and the persevering rumour of a demonetization pushed the shop owners to change the prices up to twice a day ! So, when I got my salary at the school, I rushed in the shops to spend the most possible of it, knowing that from the next day these dirty and stinking notes would have much less value ! You could also find there European products (cooked meats and canned cheeses, pastas, wines...) but those were extremely expensive : it was better to appreciate the local products. As a matter of fact, it is in Goma that I got used to drinking my coffee without milk and without sugar, because the sugar was expensive, and there was no milk except for "Nido" (powdered milk). Fortunately, I had a very good cook! The luxurious products that I bought myself ? A new television and a second-hand video recorder, good tires for the Jeep ; a small bottle of champagne and a can of pâté for the new year. The supply in water was also a big problem : even boiled 30 minutes then filtered twice, the tap water was infected and dangerous because drawn directly from the lake, where poured the sewage and where it was not so rare, even before the worst of the war, to see a corpse floating... Let's add that it's a volcanic lake of which the emanations sometimes killed rowers who were in the wrong place, at the wrong time. I had gone there the day after my arrival and had met there Mussa, the new manager who had just arrived from Kinshasa where he had had to leave wife and children. But Mussa was always there when I was there, and if I think I returned it well to him, I shall never forget the risks that he sometimes took for me (even giving me a gun to defend myself -I declined the offer- or lending me his "phonie" during several months). So I was a more accustomed to "La Michaudière" than to the "Nyira" which all the expatriates frequented dedicatedly. I went there from time to time all the same, notably because the bosses (Raoul and Mitzi) were very nice, but generally everybody knew where to find me... At "La Michaudière" I had a great cafe-terrace right in the centre, where I could meet any sorts of people (not only expatriates) and have a good time. When one lives in a town in the centre of Africa, in the middle of the riots, of the civil war and of the natural disasters, one quickly learns to manage. Example ? Yep, plain barter. I even exchanged the last barrel against the rent of a minivan with driver, just before my departure, to go take pictures in the city, some of which you saw on this page, in a more secure way (or almost: I was all the same assaulted at the market) ! It is in the same way that I had video cassettes for the long Congolese evenings (in Goma, the sun gets up imperturbably at 6 o'clock and goes down at 18 o'clock, all year long). 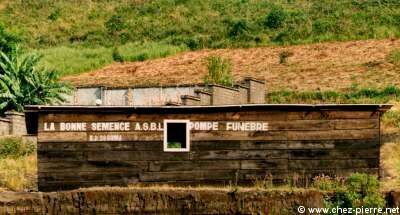 Having said that, please, do not imagine that everything was to be paid for in Goma: I received (and gave as well) so much free of charge, so much appreciated the generosity and the spontaneity of the majority of the Zairean and of the expatriates in Zaire... I stayed only one year in Goma, but I would need much more than a page to tell you how much I was at the same moment swindled (but always openly and with a smile) and at the same time welcomed, invited, fed... This is certainly part of the African magic ! 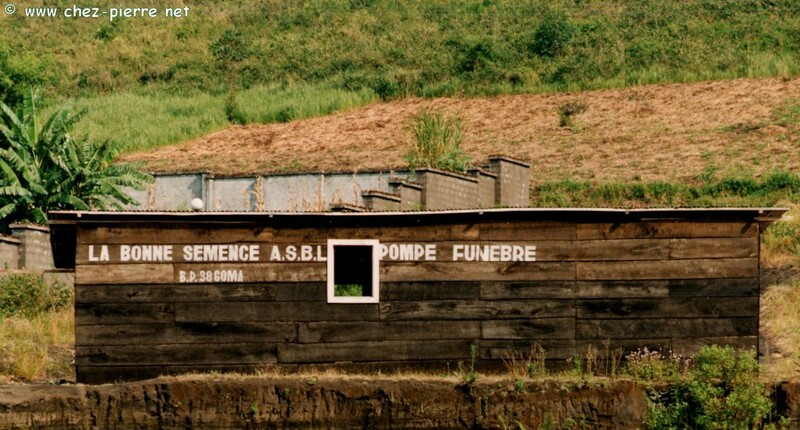 As you know, I left Goma in 1991. But I try to stay informed of course, notably thanks to the friends whom I still have there. On Thursday morning, the volcano woke up after about twenty years of relative quietness. 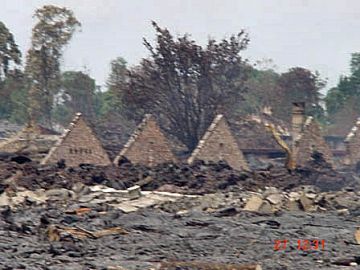 In the evening, a flow of lava, several hundreds metres wide and 6 metres high at places, invaded the town centre then threw itself into the lake. 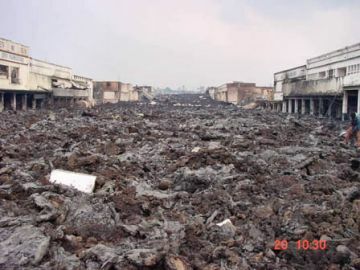 The major part of the population took refuge in nearby Rwanda but did not stay there for a long time : at the end of the eruption, three days later, people returned to assess the damages of the volcano... And of the plunders which followed. 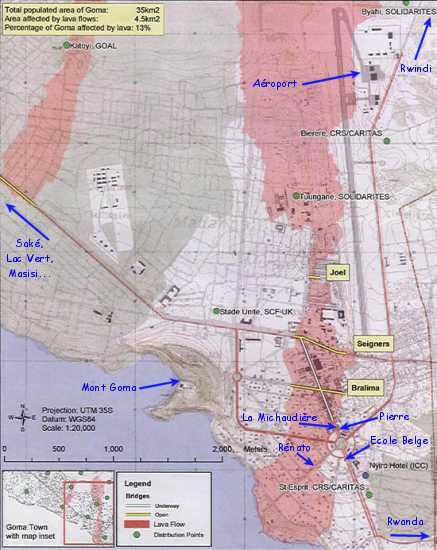 On the map, you can well see the route of the main flow, in red. A third of the airfield runway was covered, the whole town centre (1st and 3rd photos of this page), as well as part of the "township" and of the residential area of the South. My friend Rénato is one of those who lost everything : as you can see on this Giancarlo Davite's photo (as the next one, dozens of Goma's photos at the end of January here), his house but also his company buildings were completely covered by the lava, with all his belongings, his vehicles... He got out with the clothes he wore, deprived even of his passport.